Oh for a thousand tongues to sing this great stuffing recipe’s praise. It really is the best Thanksgiving dressing I’ve ever had: there’s something about the combination of the salty smokiness of the prosciutto, the crunchiness of the nuts, the tangy creaminess of the goat cheese, and the warm sweetness of the dried cherries. It all works together for the good, if you know what I mean. I learned a few things the last time I made this recipe, when I made it for the photo shoot for this post, and I wanted to be sure to mention a few caveats that could cause your results to vary greatly, so heed my warnings! Buy the most delicious loaf of bread that you can, because the quality of the bread makes a world of difference. When we did this photo shoot, we used a peasant bread made by Whole Foods bakery, and while it looked much the same as the bread that I typically buy, it didn’t have the same toothsome chewiness that we love so much about the Tuscan Bread that we buy at a local Nashville Bakery, Provence. So be sure you buy the best bread you can find. Don’t skimp here. Go ahead and cut the crusts off, because it will give your stuffing a nicer texture without the crusts, and you can grind them up for bread crumbs to be used later. Just freeze them. You won’t waste your delicious artisan bread that way. Hazelnuts are also called filberts. I went looking for them at Whole Foods, could find none, but recognized them by shape under that different name. I bought the skinless ones, and roasted them in a sauté pan on my cooktop, for 3 or 4 minutes. When you begin to smell their lovely odor, they’re about done. 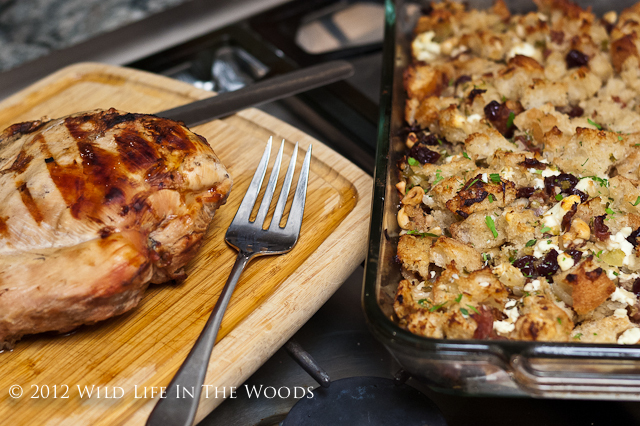 So, don’t over roast them, because they will get more oven time when you bake your stuffing. Chop those veggies FINELY (the green pepper, celery and onion) just like the directions tell you to. You’ll be happier with a fine chop. Trust me on this. I know. A yummy, yummy close up. It makes my mouth begin to water, because I know how good all those flavors are together! I usually buy the bread on Tuesday, and do the bread and vegetable chopping on Wednesday, and assemble the whole shebang on Thursday after lunch. (We eat our big meal @6:00ish) It goes in the oven after the turkey comes out, and bakes, with the rolls, while the turkey’s resting. We grilled and brined a wild turkey breast for the photo shoot. 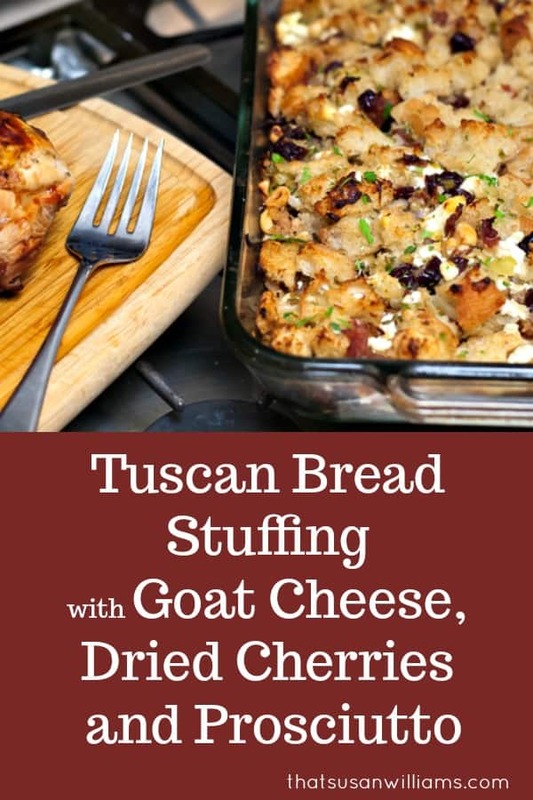 Those cherries are so sweet, and the goat cheese is so tangy, and the nuts are so crunchy, and the prosciutto is smoky, salty good! 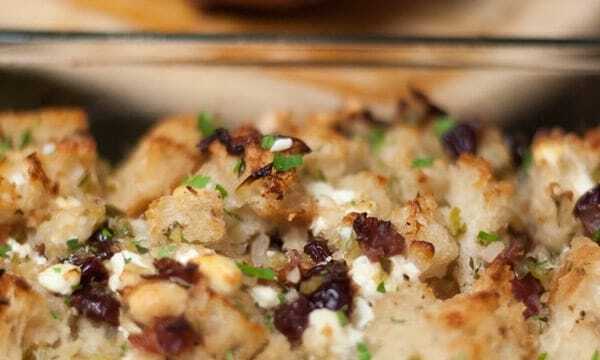 The best stuffing recipe I've ever had. Place cherry halves in a heatproof bowl; cover with boiling water. Let stand until soft, about 15 minutes. Drain. Cut bread with crust into 1-inch cubes (10 cups loosely packed). Place in large bowl. Add oil, thyme, and garlic; toss. Spread the cubes out on large rimmed baking sheet. Sprinkle with sea salt and pepper. Bake until golden and slightly crunchy, stirring often, about 20 minutes. Return to same large bowl. Melt butter in large skillet over medium-high heat. Add onion, celery and pepper to skillet, and sauté until vegetables are soft, about 10 minutes. Mix in parsley, prosciutto and cherries. DO AHEAD: If you want to do a portion of this recipe the day before, as I do, you can Toast the Bread Cubes and Sauté the Vegetable Mixture, which is the first part of the recipe, 1 day ahead. Cover them each separately. Store bread at room temperature. Chill vegetables. If you like this recipe, why not pin it on Pinterest, or share it on Facebook or Tweet it? 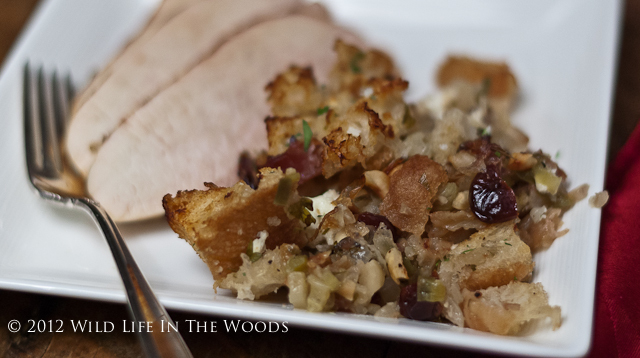 And…by the way, do you call it dressing, or stuffing?